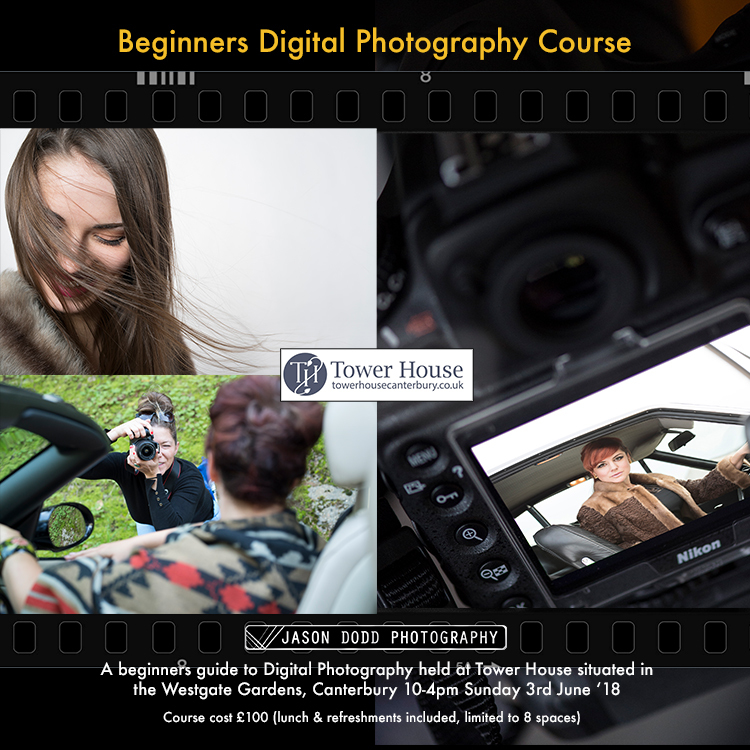 On Sunday 3rd June at Tower House in Canterbury, Kent I will be holding a Digital SLR photography course . The course is a great way of learning more about your camera's manual facilities. On the day, you will have practical sessions with a model and also access to the beautiful Westgate Gardens where your knowledge from the course will allow you to be in control of your final pictures rather than relying on the camera's Auto functions. The course will be limited to eight photographers and no prior knowledge is needed for this back to basics event, just a passion to learn. You will learn about light and composition as well as a thorough understanding of your camera's controls, including aperture, ISO, shutter speeds, and white balance. The digital photography course will be limited to eight photographers and no prior knowledge is needed for this back to basics event, just a passion to learn. You will learn about light and composition as well as a thorough understanding of your camera's controls, including aperture, ISO, shutter speeds, and white balance. This day is designed for the new photographer or anyone that needs to be brought up to date with digital photography. During the day Jason Dodd, 13 years a professional photographer and guest lecturer at the University of Kent will cover a broad range of topics related to basic digital photography, encouraging you to get the best from your camera and take your first steps in moving away from Auto. We will cover a mix of theory and practical sessions, by the end of the day you will feel confident controlling your camera and have improved your photographic knowledge, skills and techniques. The day starts at 10am and finishes at 4pm, lunch and refreshments are included within the price which is £100, gift vouchers can also be purchased. The course is listed to eight people.